This is the third part of a series about isotopes and why they’re useful and interesting to scientists. Isotopes are the flavors of elements. And because our universe is made up of atoms of elements, every object can be thought of as a delicious smoothie of flavors. Scientists like me are trying to reverse engineer those mixtures and pick out individual tastes, in order to answer questions about our world. For example, I work with giant clams. These guys build enormous shells made of a mineral called calcium carbonate: CaCO3. That means that every molecule in a clam’s shell contains a calcium atom, a carbon and three oxygens. But as you might know from reading the previous entries in this series, not all of those atoms are the same. They are a mixture of different flavors. We have some carbon-12 and 13 in there (so named for their atomic weights), and some oxygen-16, 17 and 18. Here I’m focusing on the stable isotopes, which are not radioactive and are called “stable” because they’re not going to self-destruct. There are radioactive isotopes in there too, but I don’t use those nearly as often in my work. Officer, this is a pile of giant clam powder, I swear! I am measuring stable isotopes of carbon and oxygen in my shell samples. To do this, I take a sample of powder, grind it up, weigh it, and put it into tiny little cups. We only need a very small sample: about 50 micrograms of shell material. A typical pill of tylenol contains over 300 mg of active ingredient, so about 6,000 of my samples will fit in a single tylenol regular strength pill, if you suddenly decided you needed a giant clam prescription. This tiny sample is one of thirty that I can measure at a time. Those samples are reacted with acid and the CO2 gas that is released as a result of the reaction can be processed by a machine called a mass spectrometer. The mass spec, which is in the Stable Isotope Laboratory in my building, ionizes the molecules in that gas (gives them a bit of electric charge) and then those ions are flung through an electromagnetic field. That beam of charged gas is flung around a curve. That curve is where the magic of making a mass spectrum happens. Think of the atoms in the CO2 gas from my sample as a bunch of racecars exiting the straightaway and starting around the curve on the racetrack. Only these racecars vary in weights. And the race organizers have greased the track at the curve so that they fling into the sides of the track when they try to turn. As the racecars fling into the sides of the track, they will separate according to their mass. The lighter cars will be able to make it further around the curve before they meet their demise because they have less inertia forcing them forward, whereas the SUVs in the race will barrel forward straight into the sides of the track. At the end, you have a spectrum of racecars poking out of the walls of the track, with SUVs first, then the coupes, then the compact cars and then the motorcycles, which almost made it around the bend, but not quite. Atoms in the mass spectrometer act the same way, and we measure how many collisions happen along each point of the bend in order to not only “weigh” the sample of gas, but also figure out how many molecules of each weight there are! It turns out that it is quite difficult to measure the exact number of atoms of a particular isotope in gas, however. It is much more economical and feasible for the purposes of most researchers to simply compare our mass spectrum to the results from a standard. Much like there is a literal standard kilogram and standard meter in a lab somewhere in France which is used to keep track of how much mass is actually in a kilogram, there is a standard used by all researchers like me to describe our samples of carbonate. The most common standard used is from a belemnite fossil from the Pee Dee formation in North Carolina. Belemnites are extinct squid-like creatures that formed an internal shell, and one of those internal shells was fossilized, unearthed by a researcher and ground up to become the reference for all other researchers following. Samples of the carbonate in its fossil had more carbon-13’s per unit mass than most other fossil specimens known. Almost everything you measure will be “lighter” in terms of carbon, because carbon-12 is naturally so common on our planet. Scientists needed a convenient way to put a number on this, so a simple formula was developed which would allow us to quickly communicate to each other how isotopically “heavy” or “light” a particular sample is in comparison to the Pee Dee Belemnite. The formula isn’t that important for our purposes but the units of its output are in parts per thousand, or “per mil” for short (same idea of how we shorten parts per hundred to “percent”). The symbol for per mil is a percent sign with an extra little loop at the end: ‰. To make the shorthand complete, we also need to note that this is how much the carbon-13 to carbon-12 isotope ratio of a sample differs from the Pee Dee Belemnite. We do so, we use the Greek delta symbol (δ), commonly used in science and math to represent “difference or change from.” So a sample that has a carbon-13 to carbon-12 ratio which is 20 parts per thousand less than that of the Pee Dee Belemnite is written -20 ‰ δ13CPDB. There are other samples that can be used as well, including Standard Mean Ocean water (SMOW), and the Vienna Pee Dee Belemnite (VPDB). It’s important to note which you are using so that people know the scale of your measurement! Phew, hopefully that didn’t confuse the hell out of you! Next time, I’ll talk about how different δ13C (and for oxygen isotopes, δ18O) can tell us different details about the life of an organism. Here’s a cute gif of a scallop as a chaser after all that science you read. Bivalves are so named for their two hard shell valves made of carbonate, linked by a soft ligament acting as a hinge. They use a strong adductor muscle to close their shell, and the relaxation of the muscle allows the springy ligament to reopen (you might be familiar with adductor muscles as the edible tasty part of a scallop). In deference to the bivalves, laptops and flip-phones are called “clamshell” designs. That satisfying snap into place when you spring the ligamen… I mean, hinge of a flip phone is an example of human design imitating the ingenuity of evolution. But it turns out that plenty of other members of the tree of life have also stumbled upon the durable idea of a hinged two-valve shell. On the other hand, plenty of bivalves have given up on the classic clamshell look. In fact, the ancestor of all bivalves had a one-part shell, and the hinge evolved later. Test your knowledge by trying to identify which which pictures are bivalves and which aren’t. Answers and picture sources at the bottom! A. This is not even a mollusk, never mind a clam! It’s a different benthic (bottom-dwelling) invertebrate called a brachiopod, which make up their own phylum. To put that in perspective, brachiopods are as far from bivalves on the tree of life as you are (you’re in phylum Chordata)! Yet they evolved a similar look through a process called convergent evolution. If environmental needs are the same, organisms may come to the same solution multiple times. 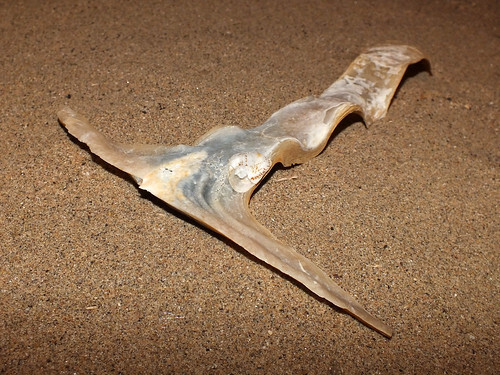 Much like wings for flight evolved independently in insects, birds and bats, bivalves and brachiopods both evolved a hinged shell as a form of protection from predation. B. These are indeed bivalves: rock scallops commonly found off the coast of California (picture by me of an exhibit at Monterey Bay Aquarium). So similar to the brachiopods in their ridged, hinged shells. Like picture A, these guys specialize in living on hard, rocky nearshore bottoms. Some cultures do apparently eat brachiopods (I have not), but I have little doubt that rock scallops are tastier. C. These are also bivalves: windowpane oysters. Also known as capiz shell, they are commonly used for decoration and art due to their beautiful, thin semi-transparent shells. A large industry harvests them off the shores of the Philippines, where they unfortunately are growing scarce due to overexploitation. D. These are not bivalves! They are crustaceans called clam shrimp. They have little legs poking out of a hard hinged shell, and have been found in some of the harshest environments on earth, where they wait in extended hibernation, sometimes years, between bouts of rainfall. E. Not a bivalve. These are another kind of crustacean called ostracods. Like clam shrimp, ostracods live in a hinged shell and swim around with the help of tiny legs, filter-feeding in the water column. 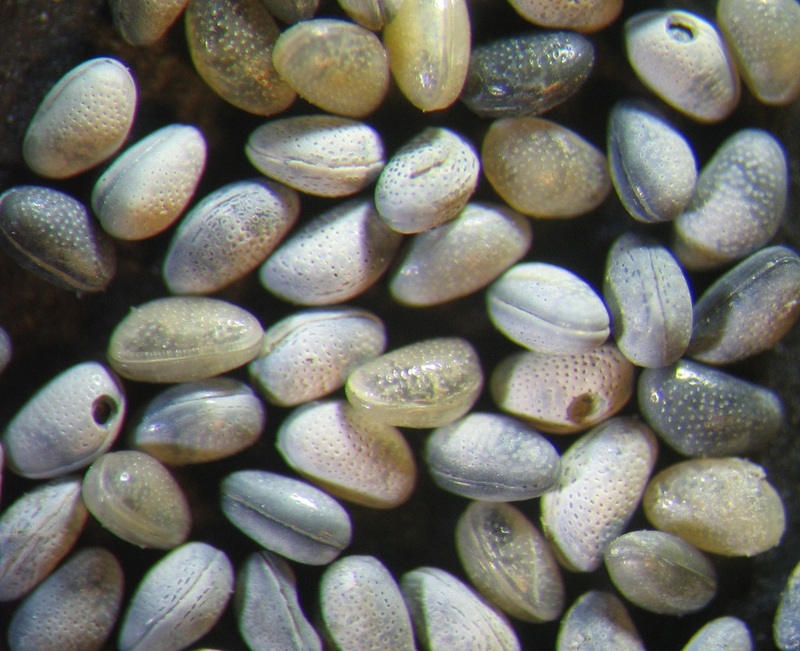 Ostracods are everywhere in the oceans and in freshwater, but have undergone an extreme process of miniaturization from their ancestral form, and are now represent some of the smallest complex multicellular life known. F. These are fossil ostracods. You can see why they are sometimes mistaken for bivalves! The givaway is that one valve is overhanging the other. Most bivalves have symmetry between the two halves of their shell, but ostracods and brachiopods do not. G. This is a snail, so it’s a close molluskan cousin of bivalves. Some snails feature a hinged lid at their shell opening called an operculum. This operculum can be closed to protect from predators and also seal in water to help land snails from drying out between rains. H. This is a bizarre bivalve called a rudist. They were common during the time of the dinosaurs but went extinct during the same extinction, 66 million years ago. While they come in many bizarre shapes, this elevator form (or as I prefer to call them, trash-can form) would have been stuck in the sediment with its small lid poking out at the surface. They could open and close the lid to filter-feed. I. This is a giant clam, Tridacna crocea! Its shell is hidden, embedded in the coral that has grown to surround it on all sides. Only the mantle (soft “lips”) are exposed, and are brilliantly colored by the symbiotic algae in its tissue. It harvests the sugars made by the algae for food. Despite being embedded in the coral, the clam does have enough room to close and pull back its mantle if a predator approaches. J. This is a one of the weirdest modern bivalves, called a hammer oyster. These guys are found in the tropics, and the hammerhead part of their shell is actually their hinge, extended at both sides. The hinge provides the surface area needed to “snow-shoe” on top of the soft sandy bottom where they live. Other bivalves sometimes take advantage and live on the oyster like a raft! K. This is a different brachiopod. Notice the lack of symmetry between the valves which gives it away. L. This is by far the weirdest modern bivalve, a shipworm. These guys live buried deep within wood and are the number-one killer of wooden ships. They secrete a long tube of carbonate and have largely given up the hinged lifestyle, looking more like worms than mollusks. This is the second part in a series how isotopes work and how they are scientifically fascinating. Part I here. It turns out a horse is not just a horse, of course. The horse is a collection of atoms, and each of those atoms has a particular isotopic “flavor”, and the collection of isotope types in the horse tells a story. At the end of the day, scientists are simply interested in reading and telling stories about our world. The tail….er, tale of the horse is written by myriad interacting processes in the universe which influence the horse’s stable isotope ratios. As I mentioned last time, carbon-12 is much, much more common than carbon-13 is on our planet, due to nuclear fusion of helium-4 in the sun. there are nearly 99 carbon-12’s on earth for every carbon-13. But that’s the base ratio if you took our whole planet, put it in a blender and mixed it all up. If you measured a particular object, such as a horse, it likely does not follow that measure exactly. It has become differentiated from the global average by numerous factors which have altered the isotope ratio. In isotopic chemistry, fractionation is our name for any process which creates a preference for a certain isotope. If chemical reactions had no bias toward any particular isotope, that 99 to 1 ratio of carbon-12 to carbon-13 would be present in literally everything including you and me. But it turns out that the biochemical dice are loaded- to make the ratio even more biased! Photosynthesis is the process by which plants take carbon dioxide gas in the atmosphere and “fix” it to make sugars, which they then use for food. The core enzyme responsible for this carbon fixation is called Rubisco (short for Ribulose-1,5-bisphosphate carboxylase/oxygenase). This enormous molecule is likely the most abundant enzyme on earth. And it turns out that it has a favorite flavor when it comes to the carbon it fixes into sugar. In fact, the entire plant is discriminating against carbon-13 in several of the processes of photosynthesis. Carbon dioxide molecules diffuse more quickly into the plant’s leaves if they include the lighter carbon-12 rather than carbon-13. “Light” CO2 also dissolves more easily in the plant’s fluids. But the biggest fractionation happens when the Rubisco molecule gets hold of CO2 and breaks it. At each of these steps, the light carbon-12 is more likely to be used by the plant than its heavier siblings. There are various thermodynamic reasons for why this is the case, but the plant is essentially a sieve removing more of those heavy carbons at every step. At the end of the process, the plant is left isotopically “lighter” than the CO2 gas surrounding it that it breathes in. Because you are what you eat, this means that you are suspiciously carbon-light, and there’s nothing you can do about it. Should have thought of that before you decided to be dependent on plants as the factory for your carbon-based molecules. Next time, we’ll talk about how we measure this, and the kinds of science that can happen once you have a nice consistent measurement to use to compare isotopic ratios between samples.